We know the infinite value of the “cargo” we transport and take all precautions to ensure safe travel. On any given school day, Jennings County School Corporation has nearly 5000 students traveling daily to and from nine school buildings. In addition to daily transportation, students often travel to extracurricular activities during the school day, in the evenings, and on weekends. Driving a school bus is a serious profession, and we are concerned for everybody's safety. Proper student conduct is an important safety factor, and we expect and require students riding school buses to follow the school rules and regulations from the time they depart for school until returning home from school. Arrive at the pick-up spot five minutes before the arrival of the bus. We do not require bus drivers to wait for you. Do not wait in the street. Stay off of lawns and private property. Use the handrail and move to your seat quickly. Sit in the seat facing forward. Do not extend your feet or arms into the aisle. No eating/drinking on the bus. No loud talk on the bus. No nuisance items including, radios, CD players, iPods, games, etc. We do not permit phone calls or texting on the bus. Take your turn; don't crowd in front of others. Look both ways and check for turning cars before crossing the street. Walk immediately to your home from the bus stop. Do not go to your mailbox, loiter at the bus stop, or visit with friends and neighbors. Trust in the bus driver's training to take care of the situation. Responsible older students acquainted with emergency procedures may assist the driver. Riding Jennings County Schools’ buses is a privilege. We believe all students deserve a safe, undisrupted ride to and from school. Violation of these rules and regulations may result in suspension or removal of transportation privileges by the principal. Always follow the directions of the driver. Ignoring directives is insubordination. Walk to the assigned seat and remain there. Absolutely no standing, moving around, or changing seats while the bus is in motion. Do not talk to the driver unless it is an emergency. Drivers need to keep their minds on driving and their eyes on the road. Keep arms, feet, school books, backpacks, and other items out of the aisles at all times. Do not open or close the windows without permission from the driver. No loud talk, profane language, or yelling. No illegal substances including tobacco products of any kind at the bus stop or on the bus. Do not tamper with any safety device or any other equipment. We forbid the possession of knives or any weapon-like objects on the bus. Do not bring items such as video games, tapes, CD players, skateboards, bats, balls, or other nuisance items on the bus. Check with the driver prior to bringing large items on the bus such as science projects or large band instruments. The use of cell phones or similar devices is prohibited on the bus. We base the disciplinary action employed on the severity of the infraction. 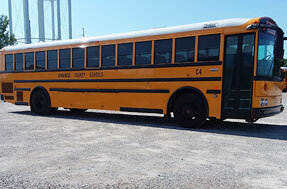 Repeated or serious offenses may result in the loss of all bus riding privileges for the remainder of the semester or school year at the direction of the principal or other administrators. All bus suspensions require notification by an administrator. Severe clause: We will not tolerate interferences with the safe, normal operation of the school bus. We have the right to suspend students engaging in severe and/or threatening behaviors without issuing a warning. A principal or designee will contact the parents of injured students. We will contact the parents of all students once we have accurate information to relay. To maintain a manageable situation, we will not contact the radio station; we determine that it is in the students' best interest to contact the media. If applicable, every student at the scene receives an evaluation from emergency medical personnel. We will also transport any students to the hospital who believe they are injured, regardless of their medical evaluation. We make all decisions in the interest of student safety and wellbeing. Many of our buses transport over 60 students at one time. Medical evaluations, contacting parents, and transportation of injured students may take some time to complete. Our drivers follow all state laws and must ensure clear aisles in the event of an evacuation. Check with your child’s bus driver regarding specific items at least three days before requiring transport. Drivers base their decisions on what is safe for the students as well as the number of students riding the bus. Items that fit on a student’s lap or on the floor between the feet or under the seat. Athletic equipment larger than a standard book bag or containing equipment (e.g., helmets, shoulder pads, bats, or other equipment) that may provide an obstacle or barrier during a bus evacuation. A project or display that uses rock, brick, gravel, wood, plywood, or other similar materials that cannot fit on the student's lap, between his/her feet, or under the bus seat. Please be assured that our school personnel understand the feelings that the news of a bus accident generates. We strive to treat all children like we would want our own children treated in an emergency situation.